Chairman of the Estonian Reform Party Faction Hanno Pevkur said in his report that the Riigikogu should understand that its role was changing compared to earlier time and should be more flexible. “In the future, the countries which have the courage to significantly reduce their legislation that regulates enterprise will be increasingly more successful. Let the market be free, and not over-regulated,” Pevkur said before the Riigikogu. “The Riigikogu has been discussing the regulation of sharing economy for over a year already. Life around us is changing very fast, and that which seems new and exciting today is already past for developers and inventors. We as a society, and in particular each of us by ourselves, must understand that success depends on readiness to embrace changes,” Pevkur said. Entrepreneur Sten Tamkivi said in his report that, in the next decade, companies exporting knowledge, services and technology with a high margin would be the success formula for the Estonian economy. “Every job created by such a company amplifies in the surrounding domestic economy into five additional jobs. Such an amplification effect increases incomes and the quality of life and solves the demographic deficit,” Tamkivi explained. In his opinion, such a vision is feasible for Estonia. At the same time, supporting technology-based enterprise need not necessarily mean directing state funds only towards risky start-ups. The Chair of the Council of the University of Tartu Ruth Oltjer explained to the members of the Riigikogu the views and expectations of entrepreneurs. She said that the most important for them was that the business environment shaped by the state was supporting, and the state would have a longer vision. That would help undertakings to make today’s decisions in the light of tomorrow. She explained that rapid tax changes were the most discouraging for entrepreneurs. On the one hand, they bring revenue into the budget, but administering them may become so complicated and expensive that the end result is questionable in the eyes of entrepreneurs. Oltjer said that, in order that Estonian companies would develop and the welfare of the people would increase, Estonia should move towards a more science-intensive economy, and favour the development of ICT and companies’ investments into research and development. Andres Herkel, Maris Lauri, Erki Savisaar, Jaanus Marrandi and Aivar Kokk took the floor and presented their positions on behalf of the factions. Jürgen Ligi, Artur Talvik, Tanel Talve and Urmas Kruuse also presented their positions on economic policy. The deliberation of the Bill on Amendments to the Traffic Act, the Road Transport Act and the Taxation Act (419 SE) initiated by the Government, which had been adjourned due to the end of the working hours of the Riigikogu on 4 May, was resumed. The Bill will establish the road user charge for lorries the rate of which will depend on the gross laden weight, the EURO-emission class and the number of axles of the lorry and its trailer. The daily road user charge rate will remain between 9 and 12 euro, and the annual road user charge rate will remain between 500 and 1300 euro. In addition, it will be possible to pay the road user charge for a week, a month or a quarter. The proceeds accrued from the road user charges are planned to be put towards the maintenance of the transport infrastructure. The road user charge for lorries will be established for lorries with a gross laden weight exceeding 3500 kilogrammes. Vehicles of the Defence Forces, the Defence League, the armed forces of foreign states, the Police and Border Guard Board and rescue agencies and vintage vehicles within the meaning of § 83 of the Traffic Act will be exempt from the road user charge. During the debate, Toomas Kivimägi, Külliki Kübarsepp, Martin Helme, Einar Vallbaum and Erki Savisaar took the floor on behalf of the factions and presented their positions. 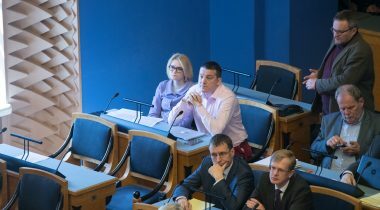 The Estonian Conservative People’s Party Faction moved to reject the Bill No. 419 at the first reading but the motion was not supported. 32 members of the Riigikogu voted in favour of the motion and 51 were against, and thus the first reading of the Bill was concluded today. Under the Bill on Amendments to the Sports Act and the Administrative Co-operation Act (423 SE), initiated by the Government, the Minister of Culture may authorise, under a contract under public law, the national Olympic committee to decide on the distribution of the subsidies provided to support sports federations from the state budget. The Bill will continue the sports funding reform which aims to create a transparent and solid financial basis for sports organisations to operate. The amendment will allow the Ministry of Culture to focus more on the shaping of sports policy because the workload in making individual decision will diminish. Depending on the year, 43–47 sports federations receive the activity support and youth sport support allocated to sports federations. This year, approximately 3.9 million euro have been provided for in the budget of the Ministry of Culture to subsidise sports federations. During the debate, Andres Ammas took the floor and presented the positions of his faction. 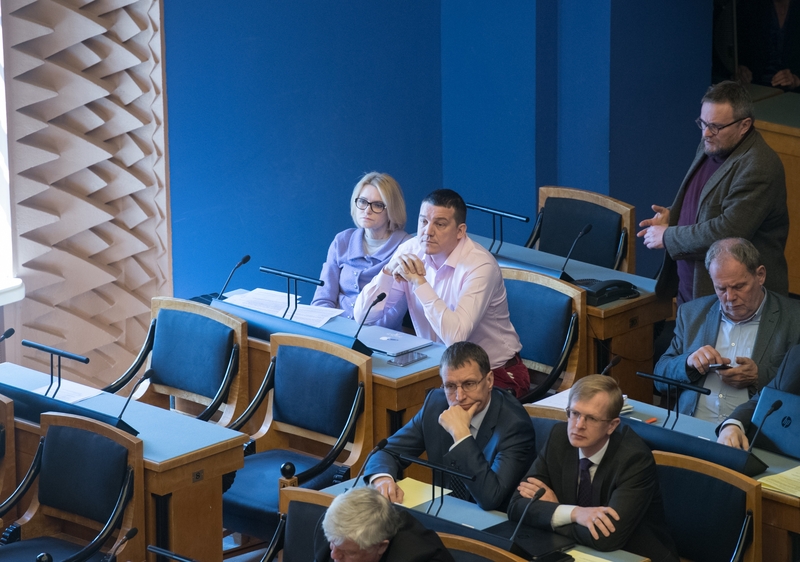 The Bill on Amendments to the Animal Protection Act and the Nature Conservation Act (392 SE), initiated by members of the Riigikogu Barbi Pilvre, Marianne Mikko, Hardi Volmer, Hannes Hanso, Rainer Vakra, Inara Luigas, Heimar Lenk, Lauri Luik, Heidy Purga, Eiki Nestor, Oudekki Loone, Jaanus Karilaid, Eerik-Niiles Kross and Liina Kersna, according to which the keeping, breeding and reproduction of animals only or mainly for producing fur will be prohibited as of 1 January 2028. The Public Procurement Bill (450 SE), initiated by the Economic Affairs Committee, which will reduce procedural costs in the case of public procurements and transpose three European Union directives. The Bill provides for raising the thresholds for public procurements which will allow for simplified procurement procedures to be used more extensively. The Bill will also create better preconditions for access to procurements for small and medium-sized enterprises, because it will restrict the right of the contracting authority or entity to require a large economic turnover for participation in a competition, and will obligate the contracting authority or entity to give additional reasons as to why they do not wish to divide up a large procurement. The Bill provides for a new type of procurement procedure – innovation partnership, which can be used for the development and subsequent purchase of an innovative product, service or works not yet on the market. The amendments also provide that, in the future, small-scale changes to a public contract will be allowed without the additional obligation to give reasons. The Bill will create the bases for transition to paper-free organisation of e-public procurements. The obligation of transition to e-public procurements will enter into force on 18 October 2018. The Bill on Amendments to the Act on Amendments to the Income Tax Act, the Social Tax Act and Other Acts (412 SE), initiated by the Estonian Reform Party Faction, according to which the additional raising of excise duty on gas compared to the prior legislative situation, that was provided for by a “cluster” Act on taxes at the end of last year, would be cancelled. The initiators note that a too big abrupt rise in the excise duty rate for natural gas is detrimental to gas consumers, the economy of the country as well as the development of the natural gas market. The Bill is intended to cancel this additional rise.